When you step foot atop Twin Peaks in San Francisco, you imbibe sweeping views of a thriving metropolis nestled in nature. There are vast swaths of gray hugged by adjacent seas of green and blue. It’s not Brooks Range-esque wilderness, but as Bill Cronon professes, “what brought each of us to the places where such memories became possible is entirely a cultural invention.” Although I don’t always completely agree with Professor Cronon’s view of a necessarily anthropogenic wilderness – San Francisco undoubtedly stands as living proof that cultural intervention has allowed for these memories to be accessible (my interpretation) to the masses, not the few private property owners. 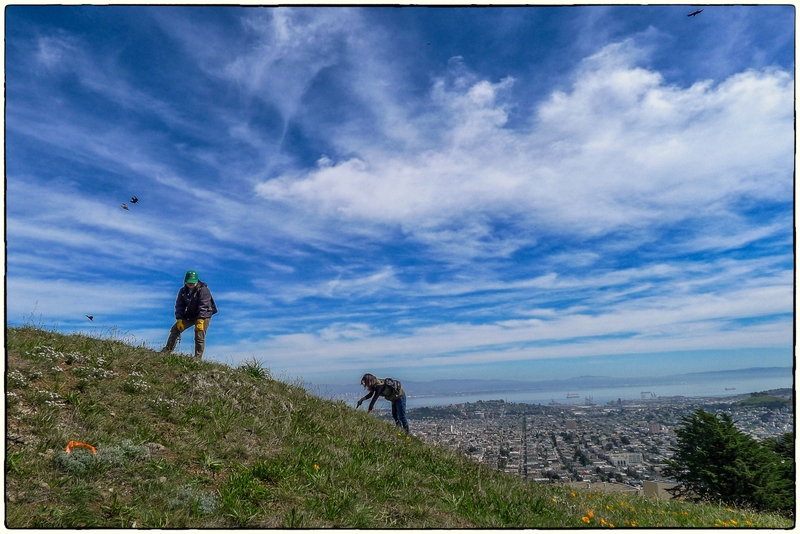 Cultural intervention has also preserved a taste of wilderness, and the home of this unlikely resident of Twin Peaks, the Mission Blue Butterfly. 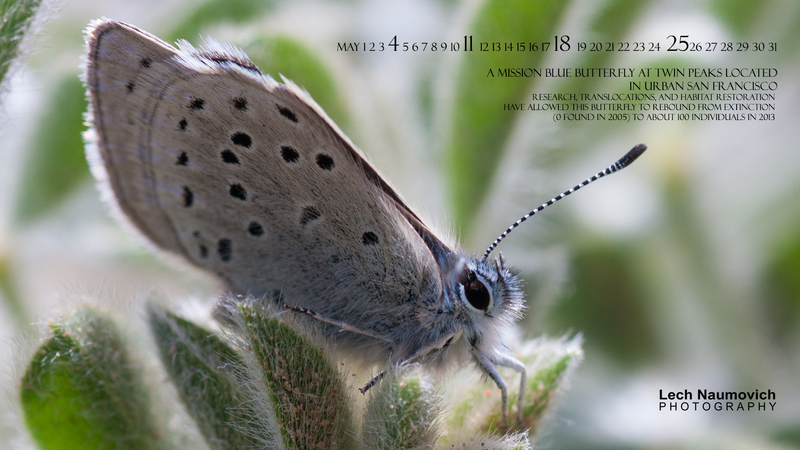 MBB’s fly from about April to May, each year, a reminder of how delicate biodiversity can be, while at the same time celebrating the incredible resiliency of this tiny, ephemeral butterfly. Two Golden Hour Restoration Institute volunteers restoring habitat for lupines, the host plant for the Mission Blue butterfly. I’ve been blessed to work with a great group of agencies and volunteers on the restoration of habitat of the Mission Blue butterfly. With a regular commitment to this site, we can help preserve this population for many generations. I hope you enjoy it. This desktop calendar is free for use on personal computers. Here’s the download to the full size picture for your desktop – Please enjoy! Thanks for keeping me posted. How important for you to remind so many of this equisitely beautiful and delicate Mission Blue contributing to the lives of millions. More need to remember. Appreciate your incite and work.